The Astoria Cove plan includes five mixed-use buildings that would be constructed in four phases over a span of 10 years. CITY HALL — The City Council voted Tuesday to approve the massive Astoria Cove plan following earlier negotiations that increased the number of affordable units and secured funding to build a ferry dock at the site. 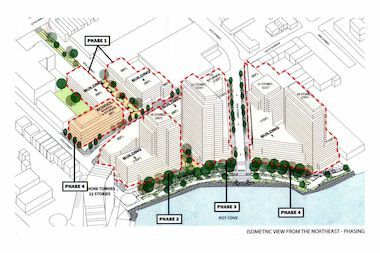 2030 Astoria Developers, which includes Alma Realty, plan to build five buildings containing about 1,700 apartments on the Astoria waterfront, as well as 110,000-square-feet of retail and public parkland, according to the developers. Rents will start at $800 for the low-income units but savings will also extend to middle-income families. Rents for those apartments will start at $1,800. Many had been critical of the proposal for its lack of affordability. Officials announced earlier this month that the developers agreed to increase the percentage of affordable floor area from 20 to 27 percent, and would work with unions to provide good jobs as part of the development. "Astoria Cove, when built, will be a transformative moment in Astoria. It'll be fully integrated, innovative, contextual and inclusive of our community," City Councilman Costa Constantinides, who represents Astoria, said at Tuesday's City Council meeting. He heralded the project for the improvements it will bring to the Hallets Point peninsula, which he said will include a school, a supermarket, a new comfort station at Whitey Ford Field and funding for the local library and NYCHA senior center. Mayor Bill de Blasio's office has agreed to supply $5 million for the construction of a ferry dock at the site, which Constantinides said would connect Astoria Cove to the rest of the city. According to the councilman, more than 460 of the project's 1,700 units will be designated affordable, with 5 percent of the total floor area reserved for families earning 60 percent of the Area Median Income (AMI). Rents for those apartments would start at $800 a month for studios. Another 15 percent will be for households at 80 percent of the AMI, with studios starting at $1,200 a month, while the remaining 7 percent will be for middle-income families at 125 percent of the AMI, with rents starting at $1,800. "This agreement will mark the first time that developers [are] mandated by law to permanently provide affordable housing that's within the reach of middle class and working class residents of our neighborhood," Constantinides said. Public review for Astoria Cove started in June, and Queens Community Board 1 delivered a list of demands for the developer in its recommendation, including a request that 35 percent of the project be deemed affordable. Queens Borough President Melinda Katz originally voted against the project, citing lack of affordable units and concerns about transit, but was supportive of the modified proposal presented earlier this month. In a statement, 2030 Astoria Developers managing partner John Mavroudis said the group "is looking forward to the next steps towards building Astoria Cove." "This transformational project will be one of the most environmentally friendly and sustainable in the city's history," he said. "Astoria Cove will bring overdue and significant investment to transform the future of the immediate community and enable connections to the rest of Astoria."